The third set of classes available at CASEE is the CASEE 3 courses- Food Science, Chemistry, and English 3. Enrollment in CASEE 3 gives students remarkable insite into the connection between chemistry and their own lives by focusing on the molecular make up of our food and its production from the ground up. 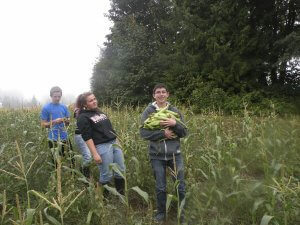 From seed to serving CASEE students study food production inside and out. Food Science is a course that focuses on the application of biological, chemical and physical principles to the study of converting raw agricultural products into processed forms of materials suitable for direct human consumption, and the storage of such products. Concepts covered include human physiology and nutrition, food chemistry, agricultural products processing, food additives, food preparation and packaging, food storage and shipment, and related aspects of human health and safety including toxicology and pathology. Science is amazing at CASEE!! Chemistry is an algebra based science course focusing on the basic understanding of chemical and physical changes, understanding the basic types of chemical changes and their importance, and laboratory skills in manipulation, observing, recording, and reporting. Projects will include studies of agricultural chemicals, cleaning and personal products, and food science. 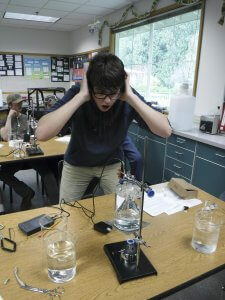 Students will become proficient in testing water, soil, and air for chemical components. Units will include organic chemistry, biochemistry, environmental chemistry, and industrial chemistry. This is a laboratory based course that will give students practice in applying their knowledge of chemistry. English 3 will lead students through a variety of literature focused on how agriculture, food processing, and culinary evolution have played a central role in American history and culture from pre colonial times to the present. Over the course of the year, students will identify and understand common themes found in literature as well as continue to work on necessary English skills for effective written and oral communication. Persuasive writing, informative writing, critical analysis, and research will be stressed.